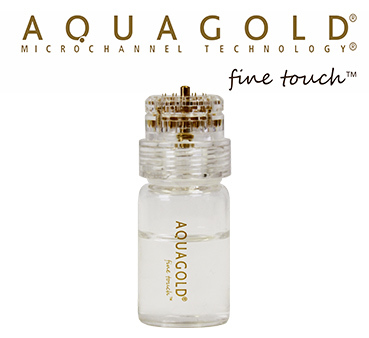 Aquagold Fine Touch ® is the newest technology utilizing a gentle stamping device similar to microneedling but can deliver results with no pain and no downtime. Results are visible in as little as 24 hours. At Seychelles, we will combine a proprietary blend of antioxidants, Botox® and dermal filler. This blend will be decided based on the condition of your skin the day of your treatment. Your customized blend can be used to treat your skin concerns on your face, neck, chest and hands. Upon consultation on the day of your procedure, we will determine a customized blend to best treat your skin concerns. We then mix your special blend into the vial. The device contains 20 ultra thin needles made of surgical grade stainless steel and coated in 24 carat gold. These ultra thin needles (each thinner than a strand of hair) will deliver your personalized blend 600 microns deep into the dermal layer of your skin. Due to these ultrathin needles, the procedure is virtually painless and there is no need to numb prior to your treatment. There is no downtime for this procedure. Upon completion of your treatment, you can expect to have a flushed appearance for up to 30 minutes. This will be replaced with a healthy glow. You can wash your face in the evening and look forward to waking up to a beautiful new you. What you can expect with this treatment? You can expect to wake up with a more youthful appearance and radiant skin. Depending on your proprietary blend we can effectively treat fine lines, enlarged pores, skin laxity, thin crepey texture, acne and acne scarring. You can expect results in as little as 24 hours and results will continue to improve and can last up to 6 months . This is an excellent treatment for anyone! We can treat all ages, all skin types and any skin imperfections This is an great year-round treatment and can deliver excellent results with no pre or post care concerns or contraindications. Seychelles want to make sure that this is the right procedure for you. We would love for you to come in for a complimentary consult. Don’t trust your skin with just anyone, at Seychelles we understand everyone’s unique skin types and taylor each Micro Botox Facial to the specific needs of our patients. Looking to Get a Micro Botox Facial in The Woodlands, Spring or Houston Area?